This charming 1 bedroom 1 bath condo located in the beautiful Sapphire Village Condominiums offers the perfect location. It is the perfect condo for a family of 4 (this limit is strictly enforced by the condo management). The family room sofa converts to a pull out sleeper. It is about a 2 minute walk to beautiful Sapphire Beach. You can spend the day relaxing on one of the best beaches in the world or snorkeling right off the beach on several wonderful reef's. For those of you wanting to explore the other nearby islands, a marina is right at the property. You can hop on a private or group boat to explore the islands. The condominium has secure gated access in the evening, two beautiful swimming pools, pool-side bar and restaurant, on-site laundry facilities and best of all, you are just a short walk to Sapphire beach. Sapphire Village is only about 1 mile from Red Hook where you'll find dining, night life, shopping, groceries, boat charters, gas and ferries to St. John and neighboring British Virgin islands. Be sure to stop by the island favorite “Duffy’s Love Shack”. Our unit is located in St. Vincent and has air conditioning, WIFI, a full kitchen, towels, linens, iron and hair dryer. You can relax on the balcony and enjoy a book with a beautiful view. Once you have come to Sapphire Village you will want to come back again and again. Hello and welcome to our paradise, the Virgin Islands! Robin and I have been traveling to STT since 2005 and have just fallen in love with the natural beauty of the Virgins! We want all of our friends to have fun and enjoy some of the gems that we have come across in our travels and adventures in the “islands". The locals vote Sapphire Beach one of the Top 3 beaches on STT year after year! The view from the beach is amazing. You can see 16 USVI and BVI islands from the beach. Sapphire is the only beach with a marina for water sports, crusing, parasailing, jet-skiing, etc. Sapphire is 2 minutes from Red Hook on the dollar taxi route. Red Hook has many amenities - grocery store, shopping, hardware store, banks, 14+ pubs and restaurants, ferry to St John. The ferry to St John leaves every hour, it's a 15 minute ride to Cruz Bay, STJ for more restaurants, pubs and shopping. Sapphire is the best location on STT. See the beach and ocean from our balcony, see pics. Washer and Dryer (token operated) in the next building, near office. 5mbps download, 3mbps upload, WIFI router in unit. WIFI included 12mbps down, 7mbps up. NO CABLE TV. Please bring your HDMI cable for online content viewing from your laptop, netflix, amazon, hulu, hbo go, etc. DVD's available for use in office. 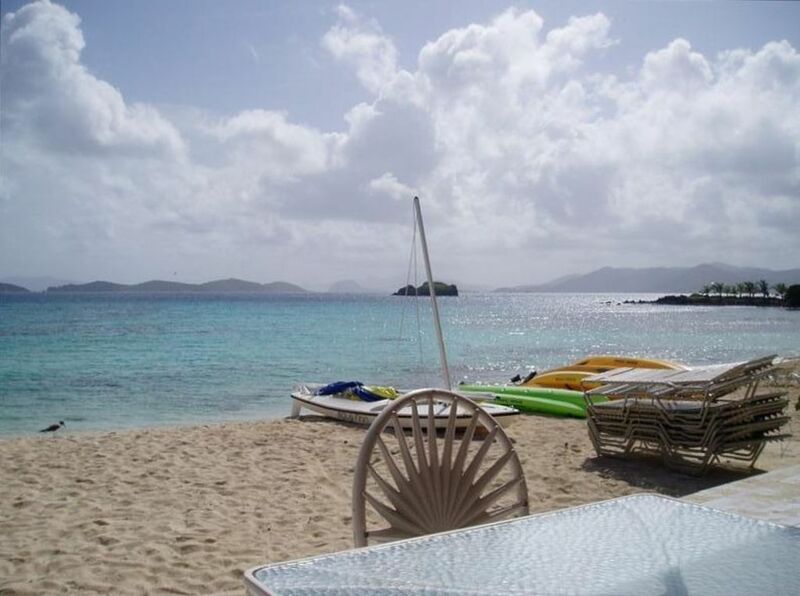 See 16 islands from our balcony, including the BVI, St John, Jost Van Dyke, Tortola, etc. Golf at Mahogany Run, the only course on the island near Magen's Bay. 2 pools in the development. Close to beach, marina, ferry to St John and Tortola, it's all here! Wonderful condo. Equipped with everything you need. Great location. Beautiful views. The owners are fantastic to work with. Have stayed here multiple times and can’t wait to go back. Totally Paradise, perfect weather people amazing and Best choice to stay. Very easy process Robin from information to ideas . John and I could never of picked such a place that was relaxing. Your condo was perfect in every way .I Will tell anyone wanting to go to Saint Thomas the Amazing stay we had in your condo . Hope we can return next year ! We had friends that booked on the other side of the Island that came for dinner and couldn’t believe how lucky we were . Again book with this couple you’ll not retreat it ❗️We relaxed in the condo every evening so quite yet when we wanted we could go to one of the 2 on site pools or bar which had good food . A very short walk past the boats to the connecting resort which had a good coffee shop, bar and grill daily entertainment which was amazing to follow entertaining people from all over the world . So relaxing the Ocean was crystal clear . Again your condo was better in person then the pictures . Clean comfortable and had just about everything one could need your great host ... Thank you so very much as I said hope to return and would love to stay at your gem again ..Cece &John . Don't want to stay any where else! Condo has everything you need to be comfortable. I have lost count of how many years we've stayed here. We usually stay between 3-4 weeks. The kitchen is very well supplied for a long stay. We eat almost all meals in so that is important to us. Robin and Alan are wonderful to work with. We just returned from a girls getaway weekend on St. Thomas. This condo is in a great location and we had a wonderful time. The owners were very kind and easy to work with. The condo is pushed back from the beach a little bit but there is a beautiful view from the balcony and an easy walk down to the beach and marina at the Sapphire Resort. We didn't rent a car while we were visiting. Taxi service from the airport was easy to arrange and the walk into the town of Red Hook (and to the ferry to St. John) is about half a mile. The road is not the best for walking along but we would usually walk down and take a taxi back pretty easily. Sapphire also has a pool and a bar which were both great once the sun went down. The condo is homey and we cooked in most nights using the equipped kitchen. The owners provided towels, beach chairs, and floats which made flying over without checked luggage easy! The condo had everything we needed and we were sad to have to leave. We'd all go back in a heartbeat! We went for a week in early December. The owners were wonderful to work with and extremely responsive from the time of our preliminary queries to final details/repeat questions the day before arrival. They were patient with me! :) We loved the condo grounds: the pools and views during day and night were delightful. Take advantage of the restaurant's happy hour! The condo residents seem to be a lovely community of nice people. The kitchen had everything we could ever need for 7 days of meal prep. My mom, kids and I all slept like babies the 6 nights we were there. We were very happy with everything. The deck is spacious, with a nice view. That was my favorite spot for breakfast and coffee. We also enjoyed the waterfront walk to that GORGEOUS beach. Our thanks to the owners! We hope to return soon. Ps. We would have been happy at the condo all day every day for our week (beach in the am, pool in the pm, meals at the condo) but here's a Tip for the [adventurous traveler]: this was our 2nd visit to the island. Both times, we rented a car and took it to St. John. If you can stomach the drive (and no, it's not jeep only, as you've probably read about. We got by fine in a yaris, on wet roads), Maho Bay is truly heaven on earth. A REAL GEM! Quiet, secluded beach with free parking and completely protected from the wind and big waves. We saw 3 stingrays there this year - just amazing. Bring your floats too! My daughter and i floated on our little mattress things for an hour, taking it all in. Just incredible. Absolute paradise!! Just returned from spending a month and already counting down to returning. This unit has the perfect location. You will be in vacation mode from the minute you walk in and see the absolutely gorgeous view. The owners have thought of everything to provide in this unit and are a pleasure to work with. You feel at home within minutes. Everything you could want is there. A bonus is you are right above beautiful Sapphire beach. When you have had enough sun return to the balcony and enjoy the gorgeous view. Red Hook is a short distance and has multiple bars, restaurants and stores. Was very sad to depart and Can not wait to return to paradise. 5 minute walk (1 minute by taxi) to Red Hook with 14 restaurants, wonderful night life, American Yacht Harbor marina and ferry to St John, VI.